CareGivers Support Group (10:30 am – 12:00 pm) @ Southborough Senior Center: Our Caregivers Support Group is for those caring for a loved one with dementia. Taking time out to get yourself support and build community with others in a similar situation are all part of the self-care which is so important to your own health and wellness. The group meets monthly. If you have any questions about this group, please feel free to call Cindy at (508) 229-4453. Southboro Wellness event (10:00 am – 6:00 pm) @ Southborough Wellness, 205 Turnpike Rd: The “Love Your Body event” includes some free sessions and workshops. Jill Vroman, a personal trainer, will be available for a Q&A session, some gentle stretching, core work and self massage tips from 10am-12pm and again 3pm-6pm. And at 6:30 pm the store is offering a Restorative Sleep Workshop. The day is also a sale with raffle items and samples. For details, see Facebook. NSPAC – “Secondary Transition” (10:00 am) @ Northborough Library: NSPAC Meeting featuring a Transition Presentation by Monique Cloutier, Transition Coordinator, Algonquin Regional High School. For details, see dedicated post. Movie matinee (Senior Center program)(1:00 – 3:00 pm) @ Southborough Senior Center: Free screening of comedy musical sequel, Momma Mia. Bowling (Senior Center Activity) (1:00 – 2:00 pm) @ Sawyer’s Bowladrome, 13 Blake Street, Northborough: Organized by the Southborough Senior Center’s Trailblazers. Meet with other active Southborough seniors for a few Strings of candlepin bowling. Suggested Donation—$5. For details, see dedicated post. 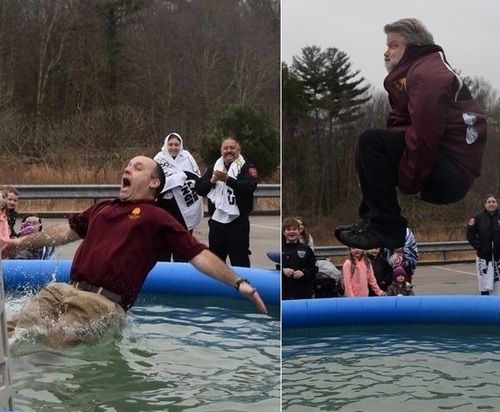 Trottier’s Polar Plunge (2:30 – 3:50 pm) @ Trottier Middle School parking lot, 49 Parkerville Rd: The 2nd annual fundraiser for the Special Olympics – with a goal to raise more than the $11,000 raised last year. Students, faculty (and some special guests from public safety) are invited to take an icy plunge into an inflated pool. For details, see dedicated post. Southboro Wellness: Restorative Sleep Workshop (6:30 pm) @ Southborough Wellness, 205 Turnpike Rd: Restorative Sleep Workshop workshop with Special Guest Special Guest Jill Vroman. Part of the store’s free monthly workshop series. Registration is not required. Bay Circuit Trail (1:00 – 3:00 pm) @ Meet at the Senior Center: Hiking/Snowshoeing with Senior Center’s Trailblazers – about 2 miles on the next section of the trail. (The Trailblazers have been tackling the big trail one section at a time.) For all of these activities, please pre-register by calling 508-229-4453 or stopping by the Front Desk. For details, see dedicated post. Light Up Sledding (4:30 – 8:00 pm) @ Chestnut Hill Farm, Chestnut Hill Road: This free event is weather permitting weekly. Early week weather looks promising for it to finally work out. But an extended forecast casts doubt on that. Check their Facebook page for the latest sledding conditions. Updated (2/11/19 2:05 pm) Filled in location and link for details on the NSPAC event.